Later this month, The Simpsons will be airing an episode that, from the sound of it, and from the looks of this photo, culinary fanatics won’t want to miss. Catch a glimpse of a Simpsonified version of some well known chefs in the photo ahead! 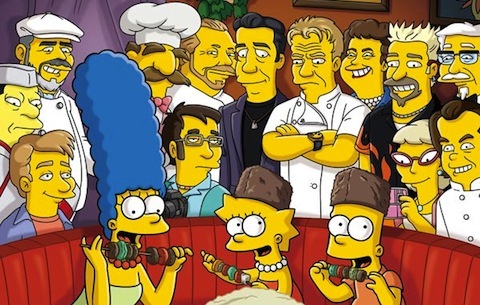 TV Line posted the photo below, along with the news that Mario Batali, Anthony Bourdain, Gordon Ramsay, and others will be voice-starring in the November 13th episode of The Simpsons, titled “The Food Wife”. The episode has Marge blogging about Homer’s love of food, with Bart and Lisa. The sour-faced man with his arms folded over his chest is obviously Gordon Ramsay (you’d have to have never watched Fox in the last few years or so not to recognize him). The man next to him with the black shirt and bleach-blonde hair has to be Guy Fieri. Is that Julia Child behind Ramsay and Fieri? To Ramsay’s right, Anthony Bourdain? Next to him, Mario Batali? Up by the top of Marge’s hair is the Swedish Chef (heh). I’m going to guess that the guy hunched down by the back of Marge’s head in the blue shirt is... Bobby Flay? A little hard to tell on that one. Is the man all the way to the right the KFC Colonel? Those are all my guesses. The man with the greyish beard near the left is familiar to me and I’m even sure I know his voice, but I can’t think of his name... Any help, readers?